In computing, tee is a command in command-line interpreters (shells) using standard streams which reads standard input and writes it to both standard output and one or more files, effectively duplicating its input. It is primarily used in conjunction with pipes and filters. The command is named after the T-splitter used in plumbing. 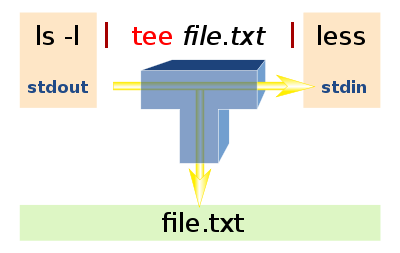 The tee command is normally used to split the output of a program so that it can be both displayed and saved in a file. The command can be used to capture intermediate output before the data is altered by another command or program. The tee command reads standard input, then writes its content to standard output. It simultaneously copies the result into the specified file(s) or variables. The syntax differs depending on the command's implementation. The command is available for Unix and Unix-like operating systems, OS-9, DOS (e.g. 4DOS, FreeDOS) and Microsoft Windows (e.g. 4NT, Windows PowerShell). The Linux tee command was written by Mike Parker, Richard Stallman, and David MacKenzie. The FreeDOS version was developed by Jim Hall. File ... A list of files, each of which receives the output. -a Appends the output to each file, rather than overwriting it. 0 The standard input was successfully copied to all output files. Using process substitution lets more than one process read the standard output of the originating process. Read this example from GNU Coreutils, tee invocation. Note: If a write to any successfully opened File operand is not successful, writes to other successfully opened File operands and standard output will continue, but the exit value will be >0. file One or more files that will receive the "tee'd" output. /A Append the pipeline content to the output file(s) rather than overwriting them. Note: When tee is used with a pipe, the output of the previous command is written to a temporary file. When that command finishes, tee reads the temporary file, displays the output, and writes it to the file(s) given as command-line argument. -InputObject <PSObject> Specifies the object input to the cmdlet. The parameter accepts variables that contain the objects and commands or expression that return the objects. -FilePath <String> Specifies the file where the cmdlet stores the object. The parameter accepts wildcard characters that resolve to a single file. -Variable <String> A reference to the input objects will be assigned to the specified variable. Note: tee is implemented as a ReadOnly command alias. The internal cmdlet name is Microsoft.PowerShell.Utility\Tee-Object. This displays the standard output of the command lint program.c at the computer, and at the same time saves a copy of it in the file program.lint. If a file named program.lint already exists, it is deleted and replaced. This displays the standard output of the lint program.c command at the computer and at the same time appends a copy of it to the end of the program.lint file. If the program.lint file does not exist, it is created. cat ~/.ssh/id_rsa.pub | ssh admin@server "sudo tee -a /root/.ssh/authorized_keys2 > /dev/null"
This example shows tee being used to bypass an inherent limitation in the sudo command. sudo is unable to pipe the standard output to a file. By dumping its stdout stream into /dev/null, we also suppress the mirrored output in the console. The command above gives the current user root access to a server over ssh, by installing the user's public key to the server's key authorization list. removes common ANSI escape codes before writing to ls.txt, but retains them for display. This displays the standard output of the command ipconfig at the console window, and simultaneously saves a copy of it in the file OutputFile.txt. This example shows that the piped input for tee can be filtered and that tee is used to display that output, which is filtered again so that only processes owning more than 1000 handles are displayed, and writes the unfiltered output to the file ABC.txt. ^ "Man Page for tee (posix Section 1)". IEEE Std 1003.1, 2003 Edition, Standard for Information Technology -- Portable Operating System Interface (POSIX), The Open Group Base Specifications Issue 6. Retrieved 1 December 2013. ^ "In Unix, what do some obscurely named commands stand for?". Retrieved 3 February 2012. ^ Paul S. Dayan (1992). The OS-9 Guru - 1 : The Facts. Galactic Industrial Limited. ISBN 0-9519228-0-7. ^ "GNU Coreutils: tee invocation". Retrieved 3 February 2016. This page was last edited on 19 April 2019, at 03:29 (UTC).